For this Saturday’s Medieval Movie Night, I decided to watch a Spanish flick (with English subtitles) on Amazon streaming: Order of the Holy Grail or a.k.a. (most unfortunately) Captain Thunder. This movie is so awful, it makes Barbarossa look like an Oscar winner. I should’ve known from the first two minutes it was going to be bad when they set the story just north of Haifa in 1291 yet the crusaders were fighting under Richard I. I double checked and yes, it clearly said 1291. So I guess they were fighting under Richard’s ghost perhaps? Seeing as Richard’s been dead oh, I don’t know…almost a hundred years by this point. I realised very quickly this movie isn’t historical fiction, it’s historical nonsense. It’s a bad, BAD fantasy but not the kind you can get into and laugh. It’s more the kind where you just spend an hour and forty-seven minutes cringing. After freeing the remaining prisoners, Thunder finds an old man in one of the cells who gives him a special chalice to take to one of the Custodial Knights, a knight named Morgano. It’s a magical chalice that, of course, can’t fall into the wrong hands, so he promises the old man he will deliver the chalice. While fleeing with the chalice – he encounters a feisty, sword wielding maiden named Sigrid, played by Ukrainian actress Natasha Yarovenko (Room in Rome, Aftershock) Princess of Thule, daughter of Ragnar – a Viking… Of course she looks awesome after being trapped in a dungeon and with all that lack of food and water, she sure fights like she’s been at a feast but we’ll ignore that and just move right along…In a pitched battle between Azziz’s son and Captain Thunder, Thunder’s mystical scar is exposed. Azziz’s son recognises the symbol as the same one on his family amulet and lets Thunder go. After his narrow escape from death at the hands of Azziz’s son, Thunder hopes to return to the Crusades. Unfortunately for him, King Richard has other ideas. King Richard asks a personal favour: that Captain Thunder to take Sigrid of Thule – “Daughter of Ragnar, a Viking whose kingdom was seized from him” – to safety. While I get that this is fantastical, the fact that they mixed Vikings and Crusaders just bugged me. I couldn’t let that one go. Just NO. 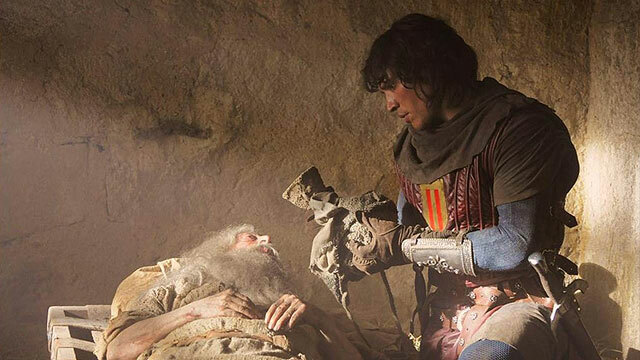 Thunder is also sent on a quest to find out what has been plaguing some local Spanish villagers. The villagers are being terrorised by “black devils” – knights garbed in black in the service of the evil Warlock, Jonathan Black. I don’t know about you, but “Jonathan Black” doesn’t exactly scream scary Warlock; Podiatrist maybe, but Warlock, not so much. Thunder is crestfallen but King Richard assures him that Saladin will still be here when he’s done his quest. Gee, that’s reassuring. Our hero, of course, ends up captured by Black because he believes Thunder holds the Holy Grail. His evil witch side kick, Ariadna, played by Jennifer Rope (Faust, Eurocanción) looks like a bad version of Grace Jones from A View to a Kill , finds out that Thunder was sent there to thwart the underworld from ruling the earth…along with a few other interesting nonsensical tidbits. The movies just rolls painfully downhill from here. There is a ruby, they capture Sigrid, and Azziz’s son comes to fight at Thunder’s side at the last minute when he realises that the symbol his father gave him is the one on Thunder’s neck. There’s some really bad CGI, another Warlock (Morgano) who is the Spanish version of Obi-Wan, more nonsense with the pentagram and the chalice and more secrets revealed until the bad guys are inevitably foiled. This movie is based on a popular Spanish comic book hero of the 1950s, El Capitán Trueno (Captian Thunder). The comic ran until the late 60s and followed the adventures Captain Thunder and his trusty sidekicks: teenaged Crispin and the aptly named hulking Goliath who likes to eat at inopportune times. The Viking princess Sigrid, who is Thunder’s sweetheart, also features prominently in the comic. Having said all this you would think it would be easy to let this debacle off the hook – it’s based on a comic, right? Well yes, but sadly…NO. The kind of fun and campy cheese we associate with comic books turned movies is lacking. The acting is just plain bad. It’s so bad you can’t forgive it. It doesn’t have that actor winking at the camera letting you know, that he knows it’s corny and bad – these guys take their roles seriously and it just comes off as stilted and unfunny. If they just realised they were in a comedy and went along with it, it might have been salvaged. Goliath and Crispin provide some of the comic relief (pun intended) but their banter is usually restricted to ones liners and then the camera is back on our intrepid hero. It would’ve been better to flesh out their relationship a bit more and give them screen time because some of their dialogue is actually funny. Instead, they’re an afterthought. The movie is one big, stinking, hot mess. Director Antonio Hernández who has done some excellent work with Los Borgia (2006) and The City of No Limits (En la Ciudad sin Límites) (2002) which won a Goya award for Best Supporting Actress and Best Original Screenplay, really botched what could have been a fun, tongue-in-cheek movie. I can’t say I recommend this – I had to fight myself not to turn it off. I just kept watching in hopes that it would get better but I was left really disappointed by the end. I don’t mind silly and campy – bring it on, but silly and campy done right. This was a disaster with the actors taking themselves way too seriously and the director not knowing how to make a funny movie. In the end, unless you enjoy almost two hours of mental anguish, this isn’t a movie you want to watch.